Our favourite TV Show Couples! Always and forever will Chuck and Sarah have our hearts. Their story was done so, so well. They pulled at our heartstrings with the emotional roller coaster ride they went on before finally getting together, and once they were together, well, they were just even more perfect. We loved that, compared to other TV couples, they kind of switched roles, Chuck being the more emotional talker and Sarah being the strong, independent, unemotional spy. This always made for the most hilarious conversations and interactions that never failed to make us laugh and smile. In addition, they had the cute, sweet, heart filled eyes when looking at each other, meant to be, warm, cozy feeling kind of love, that just made your heart leap when you saw them together. We still can't handle re-watching the final season and how the show ended though, it gets us every time...pass us the tissues!!! Is there a more adorable couple out there than Jim and Pam? We don't think so. We got into watching The Office long after the final season had aired, but with every episode we watch with our husbands we just can't get enough of how cute these two are. Jim is downright hilarious, but also so sweet and adorable when it comes to his love for Pam. As for Pam, she's just lovely. The way their story played out was one emotional ride and makes us teary no matter how many times we re-watch it. Come to think of it, before we started watching The Office we remember hearing people talking about Jim and Pam finally getting together and then when Jim proposed. It was one of those TV moments people will always remember and that's some powerful storytelling and acting right there. These two truly captured our hearts. Another Chuck couple done brilliantly. We want to say they are your typical, adoring husband and wife, however this is Captain Awesome we're talking about, they are anything but your typical couple. The great thing about Ellie and Awesome is that you know they love each other and are the perfect fit, but like any normal couple they still have their fair share of problems, be it, issues with the in laws, bachelor party mistakes and baby name struggles, but they always get through it working as a team and listening to each other. One of our favourite things about their relationship, is how protective Devon (Awesome) is over Ellie, he seriously is the cutest guy, both inside and out! Relationship goals, most definitely. We would all be lying if we said we didn't want to see Cece and Schmidt end up together. Throughout all their ups and downs and despite Schmidt's strange ways, we all knew they were perfect for each other. One of the things we love the most about them is that they know each others faults and crazy habits, they've seen each other at their worst, but despite all of that they are always drawn to each other. 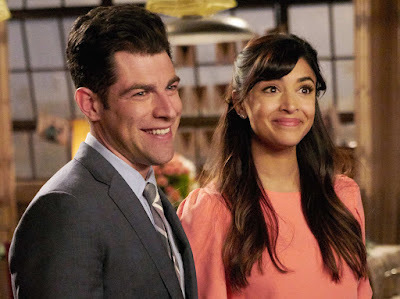 You get the impression with Cece being a super model that she could have anyone she wants, but the fact that you can tell from the start that she knows she has fallen for this crazy, goofy, strange man and she can't do anything about it, is utterly heartwarming. We didn't want to see Cece marry anyone else. It just wouldn't have been right. Who are your favourite TV couples? Let us know!